The Red Rex Theatre Co. rehearses a play about characters drawn from their own Rightlynd neighborhood in Ike Holter’s play at Steep Theatre. They hope this will be the play that will make their mark on the city, but that’s not to be. Because the story belongs to someone else. It seems the play’s writer and director wrote the script after hearing pieces of the story in a neighborhood bar. That’s the talented and energetic Lana (Amanda Powell), who spars with Greg (Chris Chmelik), Red Rex’s business-minded executive director (whose job includes sweeping up after a party) over matters creative and practical. Three years ago, Red Rex Theatre Co. moved into the empty building formerly used by locals as a squat and party house, in the gentrifying Rightlynd neighborhood in Chicago’s 51st ward (vividly described in Holter’s play, Rightlynd). Red Rex follows the theater company’s rehearsal and production process as well as their relationships with their neighborhood and its issues. Director Berry’s entire cast is stirring and believable. Jessica Dean Turner opens the play (the actual Steep play) with an emotion-laden monologue. Joel Reitsma, a Steep regular, does his usual excellent job as Adam, the love interest in the Red Rex play. (You may remember him in Birdland or The Invisible Hand.) Aurora Adachi-Winter is delightfully wired as Tori, an obsessive stage manager (who confesses that she would have liked to be a florist). And Nate Faust as Max (a Jeff-award-winning scenic designer) is a colorful, rough-edged artiste. He hates projections but ends up loading the entire scenic design on a flash drive. (Oops, spoiler.) 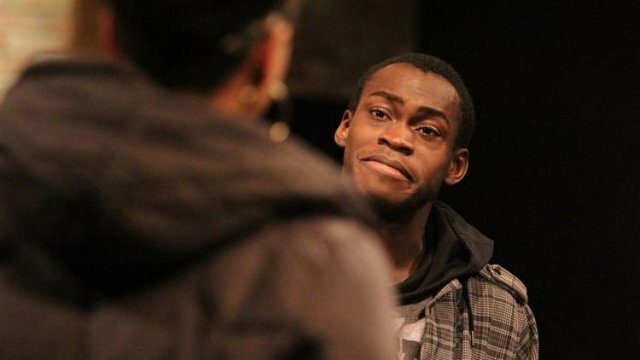 Balogun’s performance as Trevor is powerful and hyper-real. The characters played by Powell and Chmelik ground the play in the reality of storefront theater. Scenic design in the real play is by Joe Schermoly, with lighting by Pete Dully. Sound design is by Sarah D. Espinoza and costumes by Stefani Azores-Gococo. Red Rex continues at Steep Theatre, 1115 W. Berwyn Ave., through March 2. Tickets for $27-$38 can be purchased online or by calling 773-649-3186. Running time is 2 hours, 15 minutes, plus an intermission.